In the last two months, a series of meetings held in New Delhi among the organisation’s top echelon and functionaries from Assam has reportedly convinced the leadership about the pitfalls of tabling the Bill in parliament. Guwahati: Rattled by the widespread protests in Assam against the Citizenship (Amendment) Bill 2016, the Rashtriya Swayamsevak Sangh (RSS) has temporarily shelved the plan to support granting citizenship to a section of non-Muslim citizens from neighbouring countries. Informed sources in the RSS claimed that there was no scope for the Bill to come up in any of the parliament sessions ahead of the general elections next year. “If tabled in parliament, the situation in Assam could take a turn for the worse, with adverse consequences for the elections next year. Moreover, the majority of activists from the Brahmaputra valley in the state have voiced their opposition to the Bill,” a senior functionary of the RSS’s Guwahati chapter said. However, he added, there was overwhelming support for the Bill from the functionaries in the state’s Bengali-dominated Barak valley. In an interview to The Hindu last month, Joint Parliamentary Committee (JPC) chairperson Rajendra Agarwal ruled out the possibility of submitting the report during the monsoon session of parliament. He made a case for further discussions on the Bill and seeking advice from legal and constitutional experts. The proposed Bill aims at amending the Citizenship Act 1955 for allowing sections of Hindus, Sikhs, Buddhists, Jains, Parsis and Christians from Bangladesh, Afghanistan and Pakistan to apply for Indian citizenship by relaxing the mandatory waiting period to six years, from 11. The amended Bill was promised by the Bharatiya Janata Party during the general election campaign in 2014. 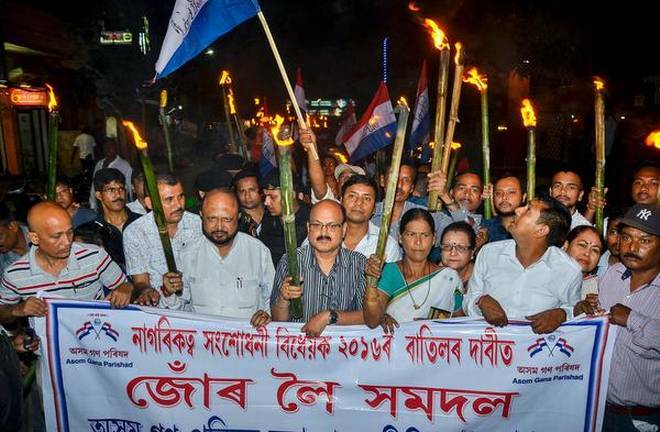 An agitation similar in intensity to the anti-foreigners movement of the early 1980s swept Assam’s Brahmaputra valley after the JPC led by Agarwal visited the state in May to solicit views from individuals and civil society groups on the Bill. The influential All Assam Student’s Union (AASU) has reiterated that the protests will continue till the Bill is completely dropped. The Asom Gana Parishad (AGP), an ally of the BJP-led government in the state, has also said that it will withdraw support from the government if the Bill is passed in parliament. The concern is due to fears that lakhs of Hindu migrants would land up in the state from neighbouring Bangladesh, which would also render the Assam Accord of 1985 meaningless, since it provides for the detection and deportation of all undocumented immigrants. The Bill will also nullify the ongoing exercise to update the National Register of Citizens (NRC), which was first published in 1951. Opposition parties in Assam, including the Congress and All India United Democratic Front (AIUDF), have also taken part in the agitation. The BJP’s stance that it would give a statement on the Bill after the NRC update has invited sharp criticism, which provoked a section of party activists to initiate a signature campaign against the Bill. Their plan to submit the list of signatures to the party leaders in New Delhi had to be abandoned after being warned by the state leadership. A dominant view among some sections of the RSS is that the Bill ought to have been “planned in advance” with the goal to address the concerns of the people in Assam. They feel that a group could have been created to interact with all civil society organisations across the state ahead of the Bill being tabled in parliament. Some among them also referred to the favourable conditions in the country already in existence for the immigrants from neighbouring countries. The Central government has already passed two notifications exempting such migrants from the Foreigners Act 1946 and the Passport (Entry into India) Act 1920, thus allowing them to continue to live in India if they had arrived before December 31, 2014. The condition of Hindu migrants at the detention centres in Assam was another issue that was broached frequently in the meetings. There has been a spate of media reports highlighting the confinement of genuine citizens declared “foreigners” by the Foreigners Tribunals. Recently, a 102-year-old man, Chandradhar Das, was released on bail in Silchar after being detained for close to three months. The issue was taken up by the RSS both with the Central and state governments, with a plea to ensure that genuine citizens were not victimised or harassed by the Tribunals and better living conditions are ensured at the six detention centres in the state. On July 8, the Assam police had issued orders making it mandatory for the superintendents of police to explain the reasons for referring a suspected foreigner to the tribunals. 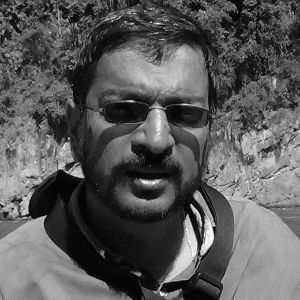 Rajeev Bhattacharyya is a senior journalist in Guwahati and author of Rendezvous With Rebels: Journey to Meet India’s Most Wanted Men.